The post-2020 international climate regime will require all countries to significantly scale up emissions reduction efforts while simultaneously increasing resilience to climate change impacts. Despite this common challenge, however, countries are at different stages of development, with different levels of capabilities. This reality must be considered when building a low-carbon and climate-resilient world in an equitable way. For the new international climate agreement to be universal, effective capacity building must enable developing countries to contribute to global efforts reducing emissions and adapting to climate change. An enhanced framework and associated processes to promote greater coordination and coherence among the thematic bodies and entities in the Convention, improved monitoring, analysis and review of capacity building activities and greater regional, national and subnational cooperation all play an essential role in driving the delivery of capacity building. Exploring ways to foster international, regional, national, and subnational cooperation. Promoting the development and dissemination of relevant tools and methodologies. The post-2020 international climate regime will require all countries to significantly scale up their efforts to reduce emissions, while at the same time increasing their resilience to the impacts of climate change. Despite this common challenge, however, countries are not all at the same stage of development, nor do they have the same levels of capabilities. This reality must be taken into account when building a low-carbon and climate-resilient world in an equitable way. In order for the new international climate agreement to be universal, effective capacity building is vital for enabling developing countries to contribute to the global effort to reduce emissions and adapt to climate change. This paper focuses on how to improve the institutional architecture under the United Nations Framework Convention on Climate Change (the Convention) aimed at or involved in building the capacity of developing countries to address climate change. To do this, this paper starts by identifying what is currently in place under the Convention to support capacity building and examines the gaps in the institutional architecture. The paper then explores various options to address these functional gaps while leveraging what is already in place in the Convention. Finally, the paper makes a set of recommendations for key elements to be included in a new article on capacity building in the new international climate agreement, including how to enhance the institutional architecture for capacity building in the post-2020 climate regime. Capacity building is currently delivered through bilateral and multilateral efforts, both within and outside the Convention. Under the Convention, more than 12 thematic bodies and operating entities undertake some type of capacity building in developing countries. These activities range from workshops to e-learning modules, thematic dialogues, technical advice and support for strengthened institutional policies and frameworks. Outside of the Convention, UN agencies, other international organizations and institutions, academia and civil society also undertake capacity building through a multitude of projects and initiatives. In the context of the Convention, efforts to build capacity for climate action in developing countries are guided by the Framework for Capacity Building in Developing Countries, agreed to as part of the Marrakesh Accords at COP 7 in 2001. These efforts are captured in annual synthesis reports, prepared each year by the UNFCCC secretariat, and are reviewed comprehensively by the Subsidiary Body for Implementation (SBI) every five years. The current international architecture also provides for lesson sharing and the dissemination of information among Parties, civil society, academia and international organizations through the Durban Forum on Capacity Building and the Capacity-Building Portal. A need to establish or strengthen permanent institutional arrangements and enabling environments fit for meeting national climate change goals. These capacity constraints are the result of insufficient resources, staff and skill retention challenges for organizations, a lack of leadership at the institutional level, failure to provide the necessary institutional arrangements and enabling environment and insufficient coordination of the broad range of capacity efforts and initiatives being undertaken. These challenges have persisted in large part due to the ad hoc, short-term project-based approach to capacity building that has dominated due to the fragmentation of institutions at the international level aimed at supporting capacity building. While capacity building is a crosscutting issue, there is no centralized institution or process currently in place to ensure coherence and coordination among the many thematic bodies and operating entities undertaking capacity building. There is also no regular monitoring and review process in place to provide the necessary guidance to shift capacity-building efforts toward ones that can result in sustained and long-term capacity being built at the institutional and systemic levels. Accordingly, this paper focuses on how increased coordination and coherence between the thematic bodies and entities under the Convention improved monitoring, analysis and review of capacity-building activities and enhanced implementation through regional, national and sub-national networks can play an important role in improving the delivery and retention of capacity building on the ground. The authors acknowledge that the Convention bodies and entities engaged in capacity building are only one part of the broader network of organizations and institutions engaged in building the capacity of developing countries to respond to climate change. The paper, however, focuses on the institutional architecture under the Convention because it is a vital part of the new international agreement and a critical arena for enhancing capacity building. The authors also acknowledge that this is only a first step in strengthening the overall approach and effectiveness of capacity building under the Convention. Improving delivery on the ground through enhanced national institutional, governance and administrative systems and through sustained provision of resources is critical. This paper highlights some lessons from the Convention’s operating entities, relevant implementing agencies and other multilateral fora that could complement and support the outcome sought through an enhanced international institutional framework. The main focus of the current negotiations for the new agreement relates to the role of the institutions under the Convention to address the limitations and challenges raised in the previous section. In particular, Parties are asking whether a new dedicated capacity-building body is necessary to address the current and future capacity needs and barriers. Some Parties have called for a new capacity-building institution or committee to be established in the agreement to carry out the functions that are not envisaged within the current institutional architecture or are not undertaken effectively by any existing body. Meanwhile, other Parties have generally supported the ability of existing bodies to address the needs and gaps identified by developing country Parties and are calling into question the need to create a new institution in the agreement. Decisions concerning these options and the exact institutional arrangements can be taken later, following COP 21. However, as will be described in greater detail below, a framework and process for addressing the institutional arrangements could be incorporated in the Paris agreement, with choices regarding specific institutional questions to follow at a later point. Developing modalities for enhanced implementation of capacity building, including through regional, national and subnational networks of experts. One or more of the existing thematic bodies under the Convention, such as the Consultative Group of Experts (CGE), the Standing Committee on Finance (SCF) or the Climate Technology Centre and Network (CTCN). Option 2: Rather than establishing or designating a dedicated coordination and monitoring and review role, enhance the mandate of each of the existing thematic bodies under the Convention to develop capacity-building strategies for their thematic work and to improve the monitoring, analysis, and review of their capacity-building activities. To move negotiations forward and ensure an enhanced post-2020 regime for capacity building, it is essential to find a bridge between these two broad positions and enable a more effective institutional architecture to emerge that addresses the core limitations in the current architecture but does not result in any unnecessary duplication of institutional arrangements or functions. The authors therefore see benefits in pursuing both Option 1 and Option 2 together. This paper considers ways to continue leveraging the existing framework and to strengthen the mandate of existing thematic bodies under the UNFCCC, while also addressing the benefits of establishing or designating a body with a permanent dedicated role to promote coherence and coordination between thematic bodies, as well as the monitoring, analysis and review of capacity-building activities. Any future institutional arrangements should build from and leverage the existing architecture for capacity building under the Convention, such as existing information-sharing and dissemination tools and work programs and additional functions necessary to achieve the goals for capacity building in the post-2020 regime. Achieving these objectives can be facilitated by the creation of a framework and processes for addressing and strengthening the institutional arrangements for capacity building under the Convention. The recommendations that follow focus on the ways to go about establishing those framework and processes. To address the institutional challenges highlighted in this paper, the new international climate agreement should put in place a framework and processes that will enable Parties to move forward in establishing a more coherent, effective institutional architecture. Recognizing that there are several options available for strengthening the institutional arrangements, along with the political, technical and timing difficulties faced by Parties in reaching agreement on these options in Paris, this paper recommends that the Paris agreement should 1) set a long-term goal or objective for capacity building and 2) define a capacity-building mechanism in the new international climate agreement that establishes a framework to address the current institutional challenges. Within this overarching ‘umbrella,’ the exact institutional arrangements can then be defined through subsequent decisions of the COP. First, this paper recommends that the new agreement establish an objective or long-term goal for capacity-building effects. Setting a long-term objective for capacity building under the new agreement is important to set the signal that will ultimately guide capacity-building efforts toward a common end point. This paper suggests the following language is included in the new agreement: “The objective of capacity building under this Agreement should be to enable developing country Parties to identify, design and implement adaptation and mitigation actions, to enable domestic technology development, deployment of appropriate technologies and to absorb finance for the implementation of the Convention.” The agreement should also emphasise the need for enhanced cooperation on capacity building to support country-driven implementation. Convention, a mechanism is not itself necessarily an institution; instead, it can be a means to create a framework for institutions and their role in a particular thematic area, see for example the Financial and Technology Mechanisms. As a result, defining a mechanism should not be seen as prejudging the type of institutional arrangements that would be put in place or enhanced for capacity building. Rather, defining a mechanism would create the overarching framework and set in motion a process to determine the institutional arrangements. Insurance that the approach to capacity building can remain flexible and adapt to the needs of developing countries as their capabilities grow and as the requirements of the Convention change. Foster regional, national, and subnational cooperation and more targeted implementation through a network of experts. It is important, however, that the definition of a capacity-building mechanism does not result in delaying the resolution of the important institutional questions concerning capacity building. To avoid this, and in order to ensure that the institutional architecture for capacity building is fit for purpose well before the Parties’ commitments take effect under the new agreement in 2020, the institutional arrangements under the mechanism should be determined as part of a work program to be initiated at COP 21 in 2015 and concluded well before 2020. 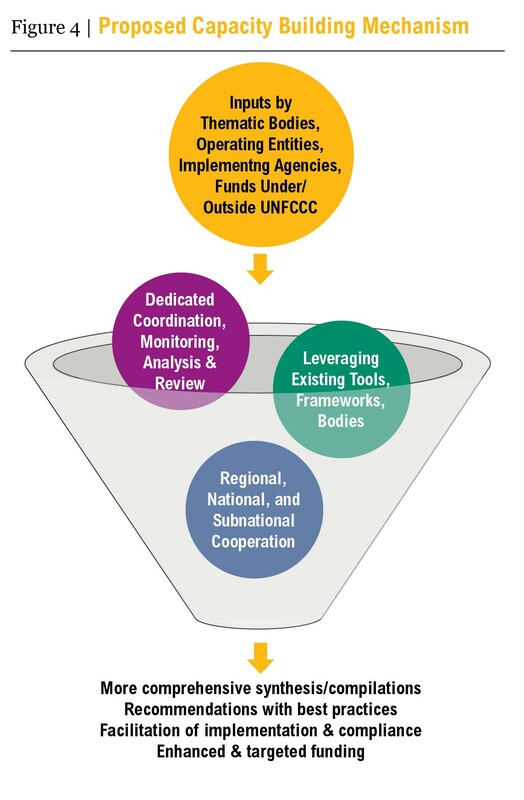 Commissioning a survey with questions addressed to all operating entities, thematic bodies, and other relevant organizations outside the UNFCCC to identify institutional gaps and additional linkages or alignment that can be achieved without creating additional burdens that are too great. Undertaking an in-depth analysis of country needs and challenges. reviewing the current mandates of the thematic bodies and operating entities and, through a process of consultation and review, identifying whether one or more existing bodies or entities could undertake an enhanced role to foster coordination among the bodies and entities and provide regular and ongoing monitoring, analysis, and evaluation of the effectiveness of capacity-building activities in addressing country needs. Developing recommendations for how the mandates of each of the relevant thematic bodies and operating entities of the Convention could be expanded to include greater monitoring, analysis, and review of their capacity-building activities. Determining whether any new institutions or bodies are needed to undertake functions not adequately addressed by existing institutions, taking into consideration all of the information gathered and analysis conducted. The output of this work program should help to strengthen and refine the institutional arrangements under the umbrella of the capacity-building mechanism and identify how these institutional arrangements function to achieve the objective for capacity building under the new agreement. Figure 1 below captures the concept behind establishing a capacity-building mechanism. It identifies the potential inclusion of existing thematic bodies and operating entities, as well as the continuing role of the Durban Form, Capacity-Building Portal, and Article 6 Dialogue in ensuring information sharing and exchange of best practices with the broad range of stakeholders involved in capacity building. The figure identifies the core purpose of this mechanism—coordination, monitoring and review and enhanced implementation—but does not assign institutions to those roles. The outputs and changes expected to result from the establishment of this mechanism are also identified. Capacity building is a fundamental precondition to a post-2020 climate regime that can promote the equitable and ambitious participation of all. This paper demonstrates that there is already a broad institutional architecture for capacity building in place under the Convention. However, despite these existing efforts, developing country Parties still face considerable capacity challenges. The new international climate agreement provides an opportunity to foster enhanced, strategic and sustained approaches to capacity building that support transformational change and enable all Parties and wider stakeholders to build the capacities they need to mitigate and adapt to climate change. Doing so will ensure that the post-2020 climate regime is one that enables all countries to take part in building a low-carbon, climate-resilient world.